For many years the name of Emperor Paul I was utterly blackened through the efforts of Freemasons and the godless, and it is only fairly recently that the truth about him has become known. Before us appears the image of a deeply religious and wise monarch, who dedicated his life to the good of the Orthodox Church and Russia. The pious pastor’s lesson bore fruit. Deep faith in God helped Emperor Paul endure the numerous trials that filled his life: the early death of his father, deposed from the throne and subsequently murdered; the alienation of his mother, who did not trust her son and who kept him away from state affairs; the many years of living almost as a recluse in his Gatchina palace; and the death in childbirth of his beloved first wife, Grand Duchess Natalia. It is known that Crown Prince Paul was offered a palace revolt in his favor, with Empress Catherine’s life being spared. The noble Paul refused, and a day later, out of fear that he would reveal the plot to his mother, he was horribly poisoned. Although the physicians were able to save the Prince’s life, the effects of the poisoning remained with him throughout his entire life. He began suffering from painful bouts of asphyxia and nervousness of character. The Crown Prince was well-aware of the danger that threatened Europe from revolutionary France. In this regard he showed great foresight and clarity of mind. The first task that Paul set himself was to save Russia and even Europe from being infected with the virus of revolution. For him the battle against revolution was a religious affair; he engaged in this battle to save the Christian faith and the godly institution of monarchy. In firm keeping with God’s commandments, Emperor Paul showed universal concern for his subjects. Even on the day of his coronation he already proclaimed a manifest concerning the serfs, which laid the foundation for the restriction of serfdom. For the first time in the history of Russia, the peasants had to take an oath of fealty. A special peasant administration was created, state peasants were allotted plots of arable land, and all peasants were granted the right of court appeal. For its time this was truly the royal “golden charter” of which the people had dreamed for a long time. In essence, half of the peasant liberation reforms of 1861 were laid down by Emperor Paul. Were he to remain alive, could he not have become the Tsar-Liberator? There was a well-known case in which the Tsar stood up in defense of peasants whom their landlord was trying to sell off separately, without their families or plots of land, in order to appropriate the peasants’ property. The peasants refused to obey the landlord’s order, and he reported the rebellion to the governor. However, the governor turned out to be a man of high principles and quickly understood what was going on. After he reported the case to the Tsar, Emperor Paul declared the sale null and void, ordered the peasants to be left in their places, and subjected the landlord to a severe reprimand. The landlord was then overcome with guilt, called all his peasants together and asked their forgiveness, and then went off to St. Petersburg to an audience with the Tsar. “Well, my good man, have you made up with your peasants? What did they say?” – the Emperor asked the guilty landlord. “Your Highness, they said to me: may God forgive you…” “Well, if God and they forgave you, I forgive you as well. Only remember for the future, that they are not your slaves, but as much my citizens as you are. You have only been entrusted with their care, and you are responsible for them to me, just as I am responsible to God for Russia…” – concluded the Emperor. His love of justice and concern for the common people were expressed by the Emperor in making himself easily accessible to his subjects by installing the famous mailbox at the Winter Palace, the key to which was held by him personally and into which both the highest official and the lowest commoner could throw their letters with requests for royal protection or bounty. The Tsar himself took the requests out of the mailbox and read them daily, and not a single one of them remained unanswered. But for us it is much more important to see the inner world of this most honorable sovereign, honorable not only in title, but also in life. Historical records for those years have preserved the description of the following event: “A strange and wondrous vision was granted to the guard standing at the Summer Palace…Shining with heavenly glory, the Archangel Michael suddenly appeared to this guard, and the vision made the guard tremble in awe… The Archangel commanded that a cathedral be erected on this place in his honor, and that this be reported to Tsar Paul without fail. The special event was reported to the commander, and the latter informed Tsar Paul of it. Tsar Paul replied: ‘I already know.’ It appears that he had prior knowledge of everything, and that the guard’s vision only served as confirmation…” From this description we can conclude that Emperor Paul was granted revelations from the celestial world. The 18th century was a time when freethinkers and the godless had already raised their heads high in Europe and were pushing nations into the bloody abyss of revolution. The main impediment in their path was autocratic Orthodox Russia, at the helm of which stood genuinely religious monarchs. The French Revolution, which gave freedom to godlessness and all manner of licentiousness, infected the minds of many members of high society in Russia. Tsar Paul was profoundly aware of the danger of revolutionary ideas for the faithful of the Orthodox Church and ruthlessly destroyed all sprouts of freethinking. Local Freemasons were forced to give written promises not to open lodges, which greatly impeded the success of Freemasonry in Russia. Emperor Paul loved his people and wished Russia to follow its own path. He began instituting reforms to abolish the privileges obtained by the nobility in the previous reign, and he primarily showed concern for the good of the peasantry and the common people. The highest circles of government saw their privileges being threatened and began conspiring to eliminate the sovereign. These traitors had major financial ties to England, whose interests were more important to them than those of Russia. Tsar Paul was distinguished by a truly knightly character and a genuinely Christian soul. He dreamed of instituting peace in Europe and restoring the altars and thrones destroyed by the revolution. But he stood alone against his secret enemies, and he was surrounded by betrayal and deceit… The forces of dark feared the influence of God’s anointed king on the fate of nations. A conspiracy arose, at the head of which stood several high officials and embittered officers who dreamed of liberties. The Emperor’s orders began to be distorted to the point of becoming unrecognizable. The conspirators very cunningly influenced the society of the capital city against the monarch. The headquarters for the conspiracy became the salon of Zherebtsova, sister of the three Zubov brothers who would be the future murderers, while at her back stood her “friend,” English Ambassador Sir Charles Whitworth. Lopukhin testifies that the participants in the murder received two million pounds in English gold through Zherebtsova. The Tsar’s treaty with Napoleon for a march on India, which would have undermined British colonial power, was his death sentence. The conspirators openly declared that the interests of England were dearer to them than the interests of Russia. The prophecy of the clairvoyant monk Abel, which he personally told to Emperor Paul, fully came to pass: “Your reign will be brief, and I, a sinner, can see your violent end. On St. Sophronius of Jerusalem you shall receive a martyric death from unfaithful servants, and you shall be suffocated in your bedroom by villains whom your are warming at your royal bosom… On Passion Saturday you shall be buried… They, these villains, trying to justify their great sin of regicide, will proclaim you mad and will tarnish your good memory.” Count Palen, the primary conspirator and murderer of the Tsar, imprisoned monk Abel in the Peter-and-Paul Fortress, supposedly for having disturbed the sovereign’s peace. The Tsar never knew about it. The murderers’ end was horrible. Practically all of them suffered great physical and emotional torment before their deaths. One of them died from over-indulging in oysters, while the three main ones, who had spread rumors of the Tsar’s madness, went mad themselves. The Emperor’s primary murderer Palen lost his sanity and ended up eating his own wastes. In such a manner the Lord punished these cohorts of Antichrist, who had dared shed the blood of God’s anointed one. After Paul I’s death the people really did not forget their Tsar-benefactor: candles burned constantly at his tomb, fresh flowers lay on it, while the common people brought their entreaties, asking for his heavenly intercession. In the Mikhaylov palace a church was built on the site of the bedroom in which he was martyred, and a holy altar placed on the very spot of the murder. In fulfillment of this testament, on 11 March 1901 Tsar Nicholas II opened the envelope after a liturgy served in the Gatchina palace and read the prophecy concerning his fate and the fate of Russia. He never said anything to anyone about this letter, but afterwards he began to fear the year 1918 and always said that that year would be fatal for him and for the entire dynasty. In our times, when there are very few people possessed of independence of mind and sobriety of thought, it would be useful to write an unbiased sketch of the personality and the life’s work of the prematurely perished monarch. 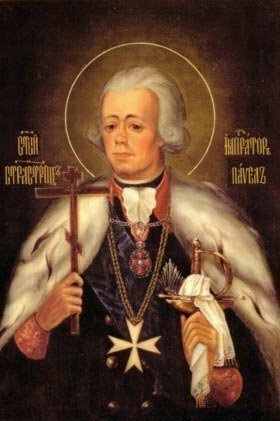 The life and the deeds of Emperor Paul should be worthily evaluated by the Church in acknowledging his sanctity and finalizing the process of his canonization among the martyrs of the Russian Church, which was interrupted by the godless revolution. As one writer said, in the brief period of his reign Tsar Paul “taught the whole of Russia the fear of God.” And nowadays the radiant image of God’s anointed one should disperse the darkness that has enveloped the Russian people. May the Lord have mercy upon us through the prayers of this royal passion-bearer! Repose, O Lord, the soul of Thy murdered servant, Emperor Paul I, and by his prayers grant us – in these evil and fearful days – wisdom in affairs, meekness in suffering, and Thy salvation for our souls. Look down, O Lord, upon Thy faithful intercessor for the orphaned, the handicapped, and the destitute, – Emperor Paul, – and by his holy prayers grant, O Lord, quick and true help to those who ask Thee, our God, through him. Amen. 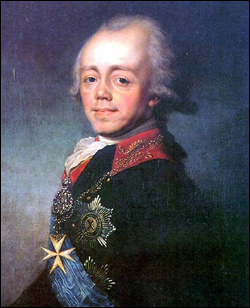 The 24th of March (the 11th by the old calendar) marks the 210th anniversary of the murder of the Russian Emperor Paul I. There were four maligned rulers in Russian history: Tsar Boris Godunov, Emperor Paul I, Emperor Nicholas I, and Emperor Nicholas II. The vicissitudes in the fate of Tsar Boris Godunov were instigated by the political interests of the boyars, especially the Shuysky clan. The history of Emperor Nicholas I was created by the Russian intelligentsia, which could not forgive him the failure of the revolutionary coup of December 1825. The fate of the reign of Emperor Nicholas II was decided not only by the Russian intelligentsia, which belonged to various secret societies, but also by foreign behind-the-scenes machinators. The fate of the heinously murdered Emperor Paul lies heavily on the conscience of the majority of the Russian aristocracy and nobility of those times, united in secret masonic societies, with the financial aid and instigation of perfidious England, to whose political interests the Russian Emperor represented a great obstacle. The personality of Emperor Paul I occupies a unique place in Russian history. He represents a turning point in this history by steering the government back towards Russian national tracks. And all that was best in subsequent Russian history has its roots in the personality of Emperor Paul and in his reforms, which have been deliberately hushed up by prejudiced liberal historians. The tragic fates of the emperors Paul I and Nicholas II are very similar in that both these Tsars were profoundly religious, noble, and honest, deeply loved their country and their people, and were surrounded by a society poisoned by liberalism and apostasy. Emperor Paul I, the son of Empress Catherine the Great, was born in 1754 and was brought up in a religious and national spirit by his grandmother, Empress Elizabeth. This immediately determined his future opposition to the spirit of liberal and atheistic Westernism which flourished in the reign of Catherine the Great. At that time many secret societies had sprung up in Russia, and many of the future Emperor’s friends belonged to masonic orders. Pressured by his friends, Emperor Paul at first also entered a masonic order, considering the Freemasons to be virtuous people. Later, however, when he learned of the Freemasons’ active involvement in the French Revolution, he rejected them completely. Thus the Freemasons’ and the nobility’s hopes for Paul’s support were not realized. The Emperor did not fall under their influence and did not become a “nobles’ tsar,” dependent on them, but in full conscience and in accordance with his principles he became the tsar of the entire Russian people, proving this by passing a series of laws and measures which benefitted precisely the common people, – and thus signed his own death warrant. Then, in order to eliminate the hateful Emperor who had constrained their personal interests, the Russian aristocracy and the Freemasons made use of an old and tried method – the spreading of lies and calumny: Paul was represented everywhere as being unsound of mind and unfit to rule, dangerous to the people and even to his own family. Even the Emperor’s oldest son – the future Emperor Alexander I – was caught in the enemies’ treacherous nets. Paul I became emperor during very difficult times for Russia: in France a revolution was raging, spreading its toxic ideas into neighboring countries; the Russian government was in a state of complete disarray; through the efforts of Catherine the Great the Church was humiliated and ruined; the aristocracy was infected with the ideas of Voltaire, Freemasonry, and atheism; the finances were in absolute shambles; soldiers and new recruits were being stolen by officers and pressed into servitude; the serfs had no rights and were mistreated. Emperor Paul put forth an incredible effort to correct all the injustices. He was the kindest Sovereign before whom all were equal – the poor and the rich, the nobles and the peasants. Through a series of reforms he ameliorated the physical and moral condition of the peasants. Being deeply religious, he curtailed the government’s harassment of the Church, gave it back all its lost estates, ameliorated the material situation of the clergy, and showed great concern for raising the clergy’s spiritual authority among the masses. But the enemy was not sleeping… Pouring buckets of dirty lies and calumnies over the Emperor, they attempted to present him as a gloomy, severely irritable, and harsh person, psychologically unbalanced. In reality Paul I was full of life, wit, and humor; he was virtuous and shunned debauchery; he was strict in regard to the national economy, trying to ease the burdens which lay on the people’s shoulders; the mainspring of his character were magnanimity and nobleness. He occupied an absolutely unique position in Russian history: having become the tsar of all the people, he did his best to get the government back on the tracks of national and Church interests, and away from blind mimicry of the West. By doing so he made many enemies among the leading class of Russian society, which was characterized by its loose morals. Moreover, towards the end of his very brief reign Emperor Paul saw the perfidy of England’s foreign policy and signed a military treaty with France. With this change in his foreign policy Emperor Paul definitively aroused in his enemies, both internal and external, an overwhelming desire to remove him from the political arena. A conspiracy was established against the emperor. He was slandered and provoked in an attempt to show supposed signs of insanity. By means of treachery his loyal followers were removed. English gold poured into the pockets of the masonic conspirators, who gained support from the embittered nobility. 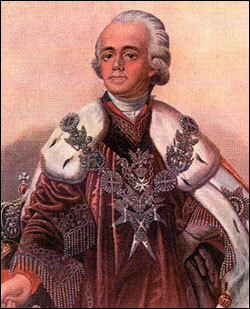 The number of conspirators, headed by the Governor-General of St. Petersburg, Count Palen, totaled about 60, primarily from the ranks of the military. The actual perpetrators of the regicide were military officers: the Zubov brothers, Argamakov, Skaryatin, Yashvil’, Tatarinov, and Benigsen. On the fateful evening of March 11, 1801, the conspirators held a general meeting at which they finalized their plans and liberally fortified themselves with libations. The final act began… The drunken conspirators penetrated into the royal palace. Entry into the emperor’s bedroom was barred by two hussars on duty, one of whom fell, stabbed to death, while the other, though heavily wounded, managed to escape and ran for help to the guards. Bursting into the bedroom, Benigsen asked the Emperor whether he would agree to sign an abdication. The Emperor, fully aware of why these people had come, asked them: “What have I done to you?” “Shut up!” – Nikolay Zubov rudely shouted in reply and slapped the Emperor on the hand. Paul instinctively pushed him away, and then the drunken villain struck the Emperor’s temple with all his might with a massive gold cigar box. Moaning loudly, the Tsar fell to the floor. Like wild beasts the entire gang – the Zubovs, Yashvil’, Skaryatin, Tatarinov – fell upon the one to whom they had sworn an oath of loyalty on the cross and the Gospel. Grinding their teeth and letting forth a stream of the most vile curses, these traitors stabbed the Tsar-Martyr with their swords, beat him with their fists, trampled upon him… and finally Skaryatin threw his officer’s scarf around the Emperor’s neck, while Yashvil’ tightened the scarf until they saw before them a lifeless body… Meanwhile, in response to the hussar’s cries, the Semenovsky regiment of guards ran towards the Emperor’s bedroom, but Benigsen restrained them by announcing that Emperor Paul had died of a stroke. With such a martyric death ended the brief reign (1797-1801) of the slandered Russian monarch, whose actions fully earned him the name of the People’s Tsar. Thus also was fulfilled the prophecy made personally to Emperor Paul by the clairvoyant monk of the Alexander Nevsky Lavra, Abel, called “the Prophetic”: “Thy reign shall be brief and I, sinner, see Thy cruel end. On Sophronius of Jerusalem at the hands of unfaithful servants Thou shalt receive a martyric end, in Thy bedroom Thou shalt be suffocated by the villains. On Holy Saturday Thou shalt be buried… They, these villains, trying to justify their great sin of regicide, shall proclaim Thee insane and shall revile Thy good name. But the Russian people with their truthful soul will understand and appreciate Thee, and will carry their sorrows to Thy grave, asking for Thy intercession in softening the hearts of unjust and cruel judges.” For his prophecy monk Abel the Prophetic was incarcerated in the Peter-and-Paul fortress by order of Count Palen. In this fortress he saw his prediction come true, and was set free by Emperor Alexander I as soon as the latter was informed of this case.